Vincentinum offers accommodation in seven double, eight triple rooms and three family rooms with 5 beds so we can accommodate 53 people in total. All rooms and bedrooms have their own toilet facility with shower and toilet, as well as possibility of using wireless internet. The bedrooms are provided with linen and towels. The Vincentinum hall has 60 seats and is suitable for meetings, lectures, presentations, educations and other events. It is equipped with the following: LCD projector, projection screen, DVD player, wireless internet, TV and sound system, and we can provide laptop for using on request. We are also here to help you with additional services such as receiving / sending faxes, printing and photocopying documents. The restaurant Stari Farof is within the Vincentinum complex and has 50 seats in the dinning room, 20 seats in the cafeteria and 30 seats on the summer terrace surrounded by natural greenery ideal for relaxation. Restaurant offer is based on local and traditional freshly prepared dishes and premium communion wines and brandies and liqueurs prepared from herbs from Velebit. Restaurant is open so that guests of the pastoral center and pilgrimage home Vincentinum can refresh themselves and all the other guests who want to try our specialties. More information about the offer of the restaurant can be found under the heading RESTAURANT on our site. For communions, associations or organized pilgrimage and other groups who want to organize their own spiritual programs, Vincentinum offers the possibility of using the church of the Assumption of the Blessed Virgin Mary and the chapel of st. Vincent de Paul. There is also a cave with a statue of Our Lady and the cross way in the open, which are both an ideal place for prayer and meditation, and will surely make an impression with the organized evening devotions. Your programs can be carried out under the spiritual leadership of your own leader, or we can provide you a leader by arrangement. Vincentinum has a safe private parking within the complex with a sufficient number of parking spaces for cars, buses, caravans or other vehicles for free. Arbour in the Vincentinum complex allows you to stay outdoors even when the weather conditions are not ideal. Staying in the arbour allows you to spend pleasant moments enjoying the greenery which surrounds it in prayer, meditation, reading a book or in the company of a family and friends along with the a barbecue and socializing. It is equipped with tables and benches for maintaining a variety of activities for a larger number of people in the open, such as a variety of workshops, group work, exhibitions, concerts, events, celebrations, seminars and field work. 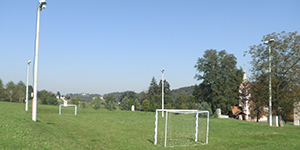 For all who wish to socialize through various recreational and sports activities, there is a grassy playground available and it is within the Vincentinum complex. So you can try your hand at football, badminton, volleyball, dodgeball, tug of war, or other grass activities. The playground has its own lighting so you can also participate in all the activities at night.